March Issue of J-14 on Stands Now! 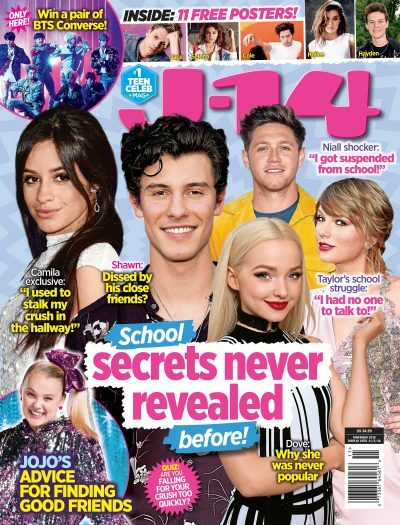 The J-14 March issue hits newsstands Monday with your fave celebs spilling all of their dating secrets inside! J-14 finds out why Justin Bieber is one more lonely boy! You'll never believe what's behind his lovesick lyrics and how he's coming between Demi and Selena. Plus: find out how to download a Justin Bieber wallpaper and score a stuffed bear kissed by the singer! Lady Gaga's secret past is exposed — right in this issue of J-14! Check out stories from her childhood, pics of the superstar in high school, and even a page right from her old yearbook. We get to the bottom of Taylor Lautner and Taylor Swift's secret bond. Read all about how they helped each other through tough times and find out who said: "I never viewed him as a hunk." Nick and Selena have finally been spotted out in public, but J-14 saw the signs of a Nelena reunion long before! Read about Nick's plea to Selena and the hints he dropped only to us. Bonus: get updates on the future of the Jonas Brothers and Kevin and Danielle's relationship! Your fave celebs like Selena, Zac, Demi, Rob, Kristen, have some hot love secrets to share! You'll never guess which of them are lucky — and unlucky — when it comes to love. Lights, camera, action: J-14 takes you on the set of Victorious with exclusive, never-before-seen pictures and backstage dish from the new Nickelodeon show starring Victoria Justice! And of course we have tons of awesome friendship quizzes (Can you balance boys and buds? ), truth or dare, embarrassing moments, beauty, fashion, tons of prizes on March's Win It Blowout calendar and a trip to the American Idol finale, glossy posters of Justin, the Gossip Girl cast, Taylor Lautner, Miley and Liam from The Last Song, and so much more! The March issue hits newsstands Monday!